Music at GROM is central is to the creation of their cars kits. Music affects our moods and the direction of our thinking.As drivers, it can sooth our anxieties while driving through rush hour traffic. During long dull drives, music can excite and reinvigorate us. Music wears many faces and can seem drastically different depending on the artists, musicians, arrangements, and songwriting. From full orchestra symphonies to three-piece punk bands, music creates different atmospheres and arouses different responses from us. A DJ and rapper can have a significantly different response from an audience than a four-piece acoustic, folk group. Likewise, different audiences and personalities are attracted to these varying visions of what music can materialize as for its listeners. GROM understands that a large medley of artists and listeners enjoy music while driving. Its customers are a diverse mosaic of audiophiles. That is why GROM has developed a new vision of one of its classic car kits. The Auxiliary Interface GROM-IPD3 was developed primarily for customers who connect their hand-held devices to their stereo through auxiliary 3.5 connections. This classic kit provided clear, high quality sound through these basic connections. As time passed and technology developed, GROM realized that so have its customers understanding of music technology. This is why GROM is preparing to release GROM-IPD4, the next generation of this classic kit, with new features to bring greater value to its customers. 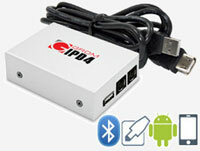 GROM-IDP4 features full USB port integration for Android phones and iPhones via USB cables. USB offers a higher quality sound, along with stereo assimilation. You can control your hand-held devices (e.g. Android and iPhone/iPod) through your car-stereo and have all information available from your hand-held device displayed through your stereo console. GROM-IDP4 additionally offers 2 extension ports for the Bluetooth Dongle and AUX 3.5mm phone jack connection. Bluetooth Dongle makes it possible to use a Bluetooth connection to operate your smartphone via its wireless antenna. This allows not only for wireless music streaming through integrated car stereo controls, but also hands-free phone calls too! The infinite visions of what music can be are astonishing. It is amazing to see how music continues to evolve and sprout new branches of ingenuity and originality. GROM feels the same can be said with the technology of music listening. This technology not only enhances the experience of listening to music while driving, but also ensures the safety of the driver—such as Bluetooth voice activation that allows drivers to keep their attention on the road while selecting music. GROM will continue to search and develop new ways for their customers to listen to music while they drive. The evolution of music constantly inspires them to continue to redevelop their car kits.